I usually like to get a post in right around 20 games left, so I can properly use the phrase “we’re past the quarter pole in the Caps’ season.” I guess it’s still correct, but it loses some of the luster to me. I didn’t know if I should post today, or Sunday after the next two games. I figured I’d go ahead and give a little reading prior to the Rangers game to those interested. Sunday usually has a few other good pieces, and there will be plenty of articles recapping the next games. So read those, because they’ll be far better than anything I type up. 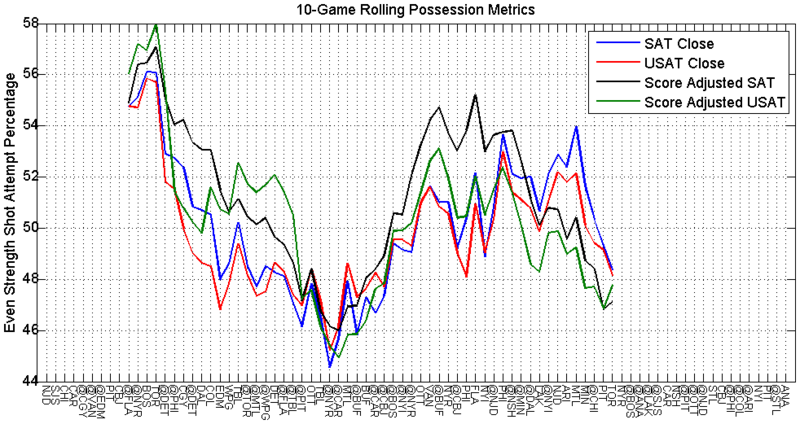 That’s sorted on the era-adjusted goals per games played. 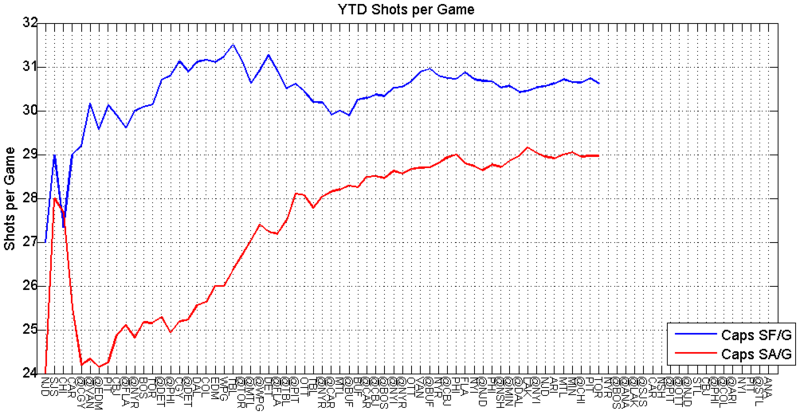 Unfortunately, the era-adjustment applies only to the season wide, so this kind of confounds the data, because players skating in a lockout shortened season benefit. So Mario could be higher than Ovi if that were properly considered. 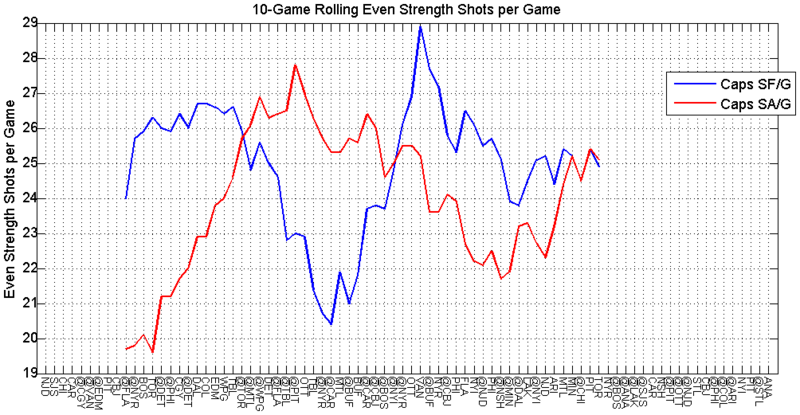 Stamkos could potentially make some noise if he increases his shot generation somehow. But this data only captures 8 seasons of Stamkos’s career (because that’s all he has), so he could slow down, or find a renaissance similar to Ovi. 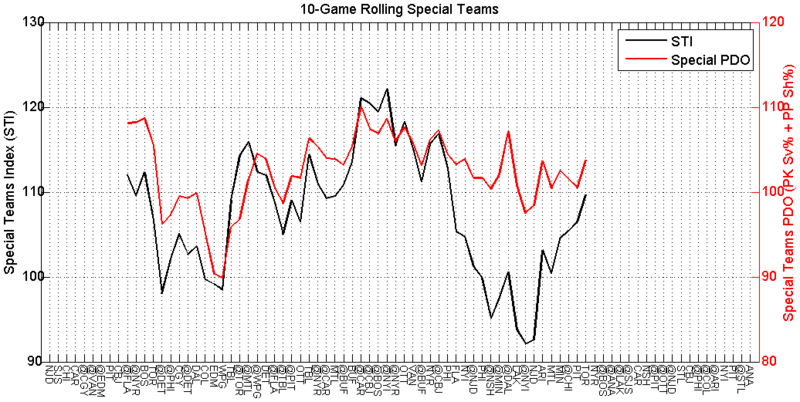 However one wants to qualify the data and the conditions, Ovi is special. And don’t let anyone else’s opinion spoil your appreciation for one of the (if not the very) best to ever lace up a pair of skates. So how has the captain led his team in the last 10 games? Well, let’s take a look. The Caps are not setting the world on fire in the ol’ possession game. 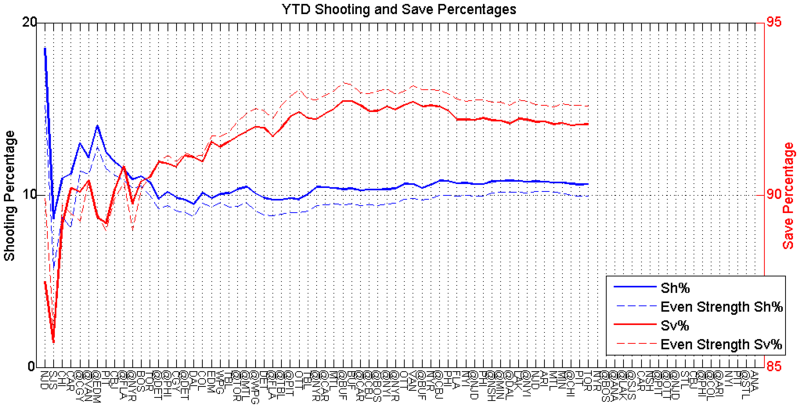 Their YTD score-adjusted SAT% is the best metric they possess, and it’s on its way down. Mostly in part, thanks to the last 10 games. Granted they had some very good possession teams on the docket. 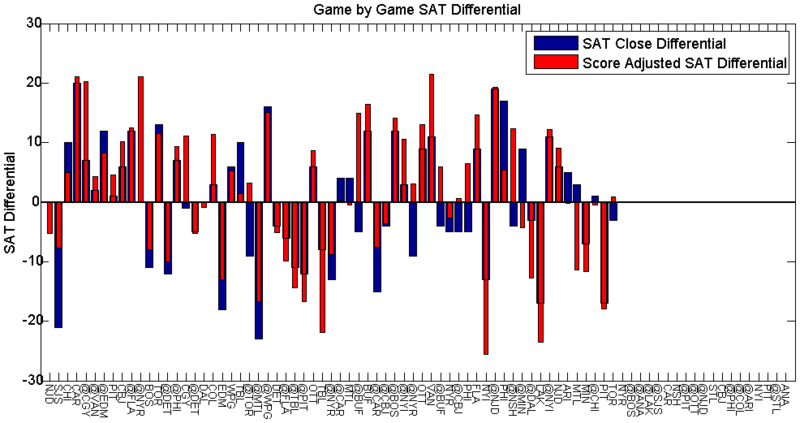 LA, Chicago, Montreal, Pittsburgh are all in the top 10 in score-adjusted SAT%. Of course, I’d love to see the Caps handle those kinds of teams, and even beat them in the possession game, but there’s little to find worth complaining over in this season for the Washington Capitals. 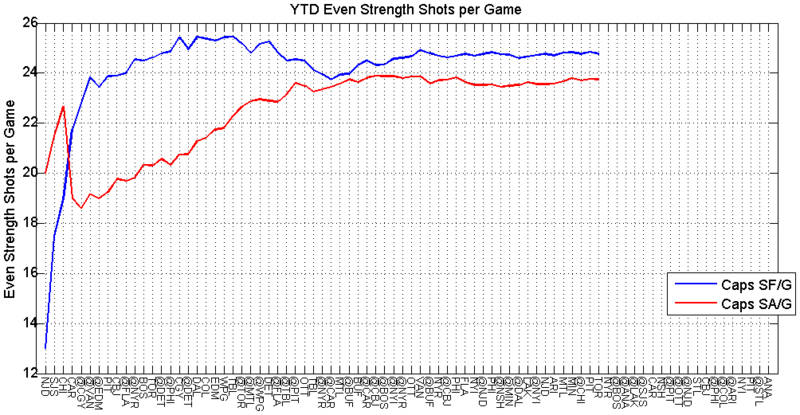 The Caps are still outshooting their opposition, and doing so at even strength. This is still good, and encouraging. 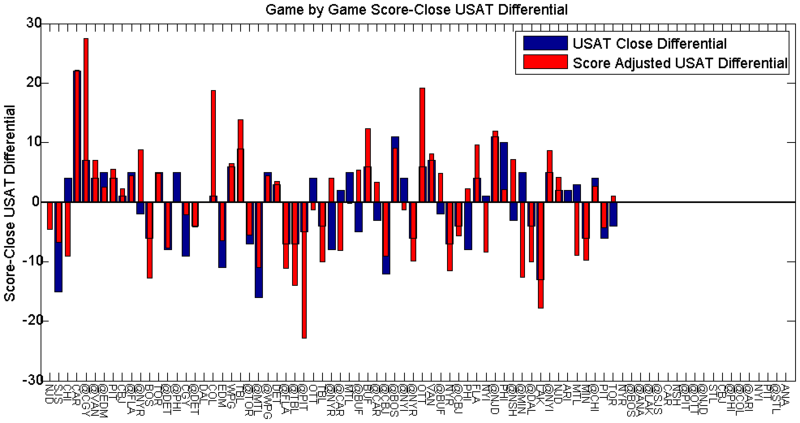 Although in the last 10 games, a bit of a different pattern has presented itself. Rather than the Caps being outshot because they gain the lead and don’t lose it, they’ve been ceding the lead, and demonstrating their resilience and coming back in all different manners. 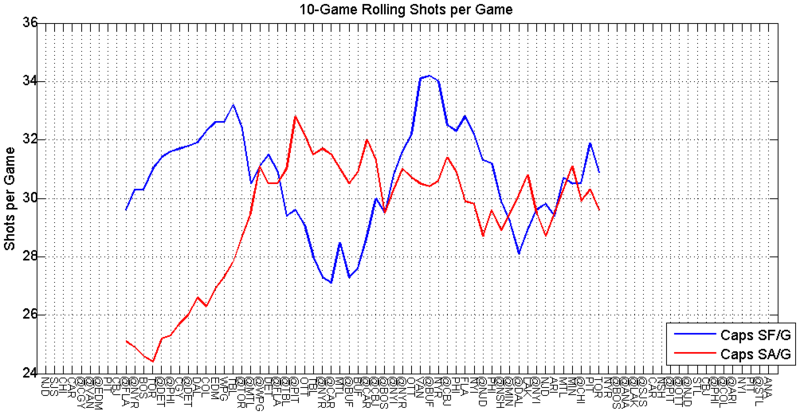 So the shot differential may be skewed a bit by the Caps having to play from behind a bit. 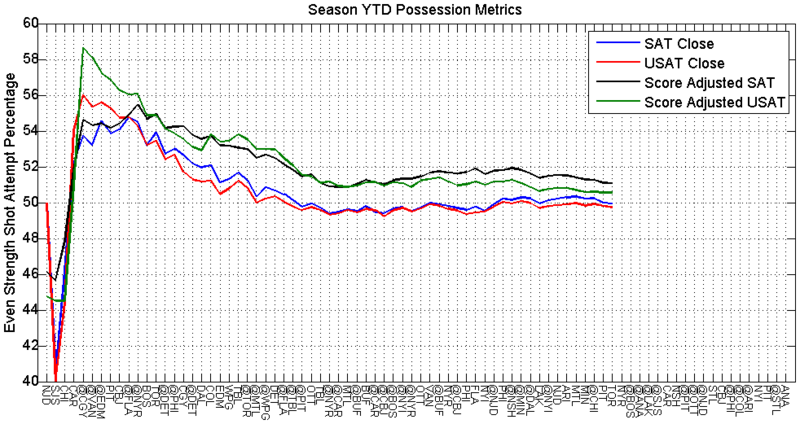 The PDO has finally started a bit of crash. The Caps aren’t scoring on one out of every 10 shots for the first time in a long time. 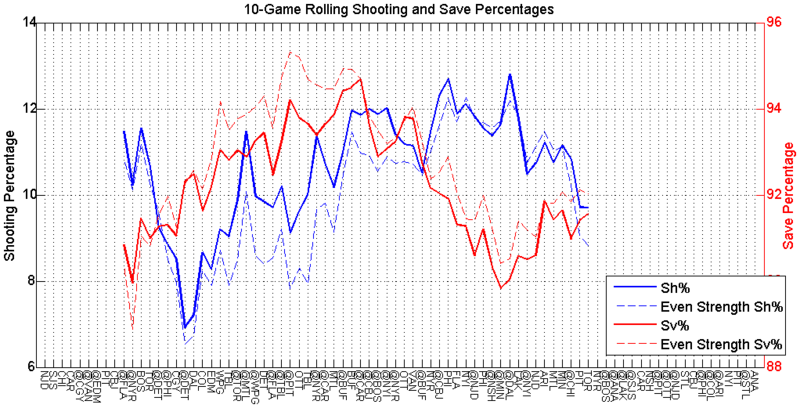 I’m hopeful the save percentage can rebound a bit more too. 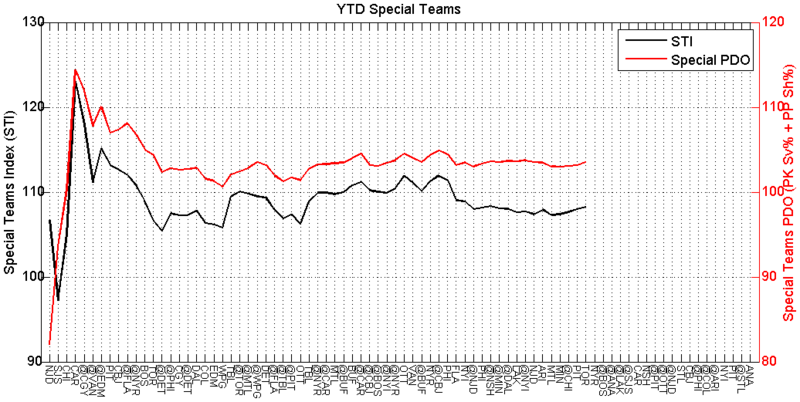 It’s been on a steady decline in the YTD data, thanks to an extended period under 92%. I wouldn’t get too concerned over the minor dip though. It could mean the Caps are about to come back to earth in a hurry, or they could be a team that possesses a skill premium to soften the blow. Special teams are resurging in a big way. Anyone who’s been watching lately can attest to that. But let’s take a deeper look at the individual elements. It’s nice that little lull didn’t last too long, but the Caps still aren’t as good as we’ve seen them. I hope this is a return to form, but I’m not counting on it. 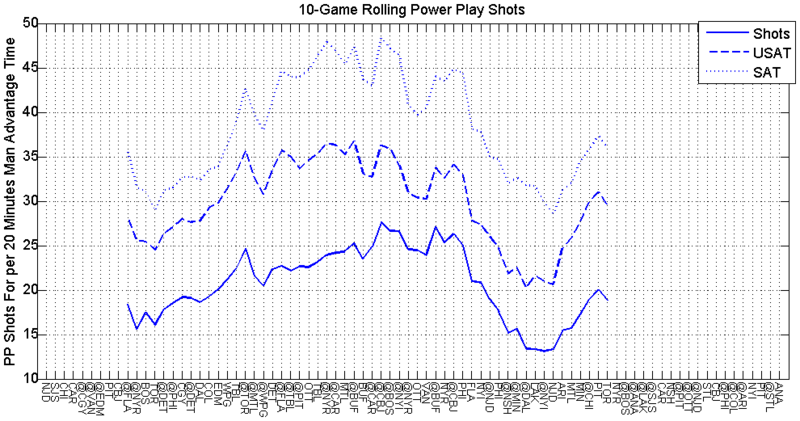 So much of the shot generation tends to run through the delivery to the Ovi one timer. And with Carlson out for a while, it would seem like Trotz isn’t married to Niskanen manning the point, since we’ve seen Orlov get significant time running things. So there could be some growing pains as the unit gets into a groove. 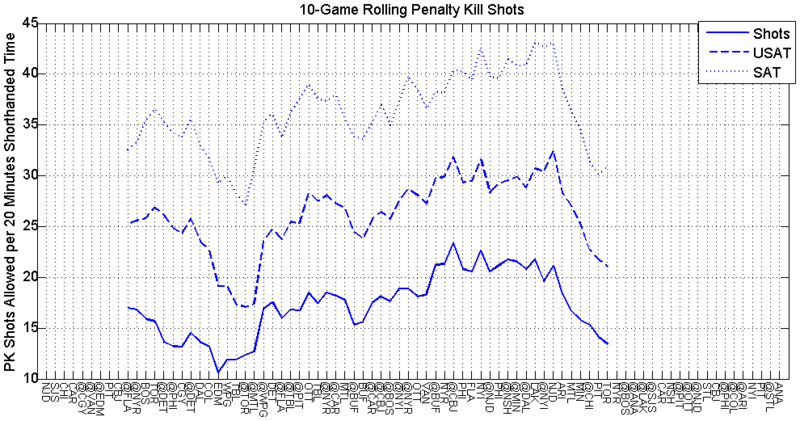 In other news, the Caps are getting quite a few more penalties drawn. That is good, but probably not an item to place much faith in. I don’t want to get too worked up over them getting no calls in the playoffs, even though both parts of that sentence are inevitable. This is a very encouraging sign. 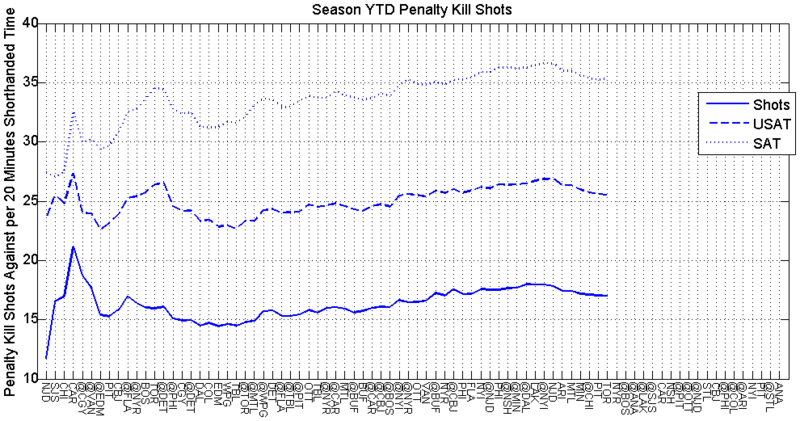 The Caps aren’t taking many more penalties than they have been over the rest of the season, and when they are penalized they’ve done very well in limiting team’s chances. 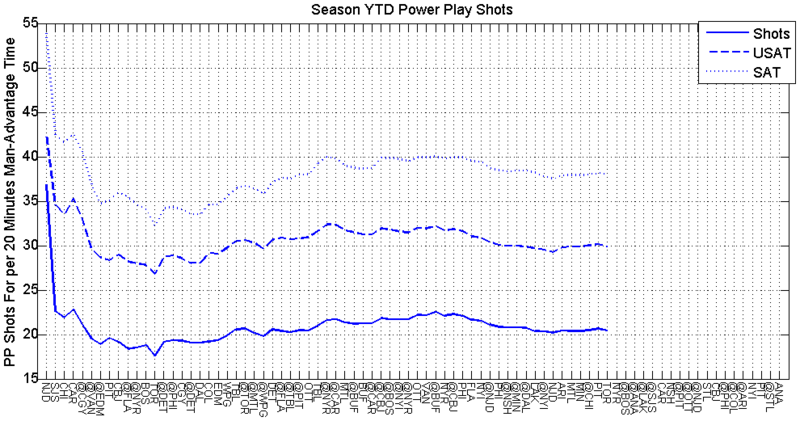 Keep in mind, that the last 3 teams’ power play units can be considered elite in some manner. Toronto creates a ton of chances, but for whatever reason don’t convert much. Chicago is the second best power play unit behind the Caps, and Pittsburgh has Crosby, Malkin, Letang, and Kessel on their unit. Keep it up Caps. There’s not much else to report from the other plots I usually present. No major changes in how the Caps are performing based on score, and it’s all but a formality that the Caps haven’t clinched a playoff spot.